Ancient Coins for Education - Byzantine Coinage - They Are NOT Just Ugly Scraps of Bronze! Home Attribution Project Help Coin ID Helpers Byzantine Coinage - They Are NOT Just Ugly Scraps of Bronze! Byzantine Coinage - They Are NOT Just Ugly Scraps of Bronze! This article was written by Zach "Beast" Beasley for the December 2006 issue of the Celator. Zach shares his unique perspective on this often unappreciated type of coinage. When I began collecting ancient coins, I started out with a Gordian III AR antoninianus. It's an eye-appealing coin and still in my collection. The Latin legends, good metal and well-executed design attracted me to Roman Imperials. Looking around at some other ancient cultures, I saw high-grade Greek silver was going to be too expensive for my meager budget on one end and some scrappy, ugly, poorly-stuck, bronze things, supposedly Byzantine bronze coins. I knew I certainly didn't want to throw away good money collecting THOSE terrible hunks of garbage! 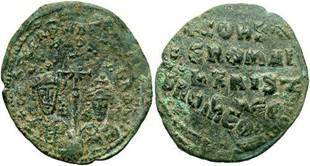 Well, about a year after my very quick decision I wanted nothing at all to do with Byzantine coins, along comes who would become a good friend of mine, Steve Santore. Steve and I both extensively collect Late Roman bronzes, but Steve also had collections in other categories, such as European AR thalers and Byzantine. Byzantine?! I was stunned. Why on earth would anyone collect Byzantine coins? Well, thanks to Steve showing me the light, I now have several hundred wonderful Byzantine coins and actually go out of my way to look for more. There is disagreement as to when the Byzantine period officially began - some place it with the move of the capital of the Roman empire from Rome to Constantinople by Constantine the Great in 330. Others contend it began during the reign of Anastasius in 491. Personally, I use the coinage reform of Anastasius as the beginning, since it is radically different from the Roman Imperial coinage. Beginning with Anastasius, we find very large folles, attractive gold and silver issues. Throughout the entire millennium-long run of the empire, there are many different denominations issued by a wide network of mints. Some pieces are as intricate and interesting as even the Greek coins, what many numismatists consider the high point of ancient art on money. Oh sure, there are "scrappy" Byzantine bronzes, but often they are only scrappy at first glance. When one begins to study the coinage, a whole new appreciation for them comes into play. I have to admit, when I first saw some of the AE folles, I was put off by the seemingly simplistic art, ragged flans and overstrikes. However, looking at what was going on in the empire, taking into consideration the movement away from personalization on coins and iconography and the lack of funding for art in general at the beginning, it makes sense why the coins look the way they do. Many times, folles are found overstruck on folles or even a different denomination of a previous emperor. This can make identifying the host and sometimes even the new coin challenging, but I've found it is an entertaining and exciting challenge. Countermark punches also were used, but I've not encountered this practice too often and I struggle with calling it a countermark versus an overstrike, when so much detail was used. Some of the series will even appeal to the "must have one of every year" type of modern collector. For example, the Maurice Tiberius dated folles can be collected by mint and year. Just don't try to put them in a Whitman folder! Normally you would have seen several links by now in this column, however, I could not find too many Byzantine collections on-line! Why? I don't know. Come on you Byzantine collectors - show the world Byzantine coins are worth collecting! Yes, there are some of the usual haunts, such as Dave Surber's excellent site: http://wildwinds.com/coins/byz/i.html and your humble writer's own Byzantine section: http://www.beastcoins.com/Byzantine/Byzantine.htm and even a new kid on the block, the Tantalus database: http://tantaluscoins.com/browse.php?type=4&cur=1 but I could not really find any collector-specific site in my searches. 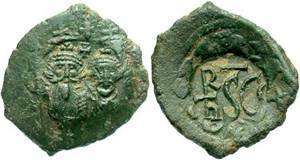 There are some great sites out there with a lot of Byzantine empire information, which includes some coin photos, such as http://www.wegm.com/coins/byindex.htm and a private collection of Byzantine coins at http://www.byzantinecoins.com but that site has not been updated since 2002. Hopefully I've enticed you to at least give Byzantine coins as chance. They may not be something you ever considered collecting, but with 1000 years of history under their belts, there are a lot of challenges in them. The Internet Site of the Month is the Dumbarton Oaks Research Library and Collection at http://www.doaks.org Until writing this column, I had not heard of this site and only found it via a search at http://www.google.com The Dumbarton Oaks collection is one of the largest Byzantine collections in existence - around 12,000 coins!